Yesterday afternoon, Interior Secretary Ryan Zinke was stuck in the airport. 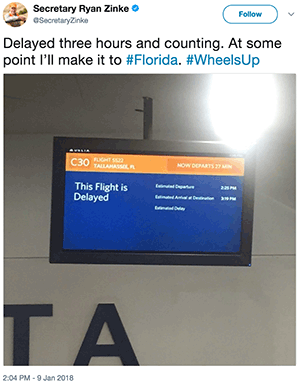 "Delayed three hours and counting," he tweeted at 2 p.m. "At some point I'll make it to #Florida. #WheelsUp." Two hours later, the agenda for Zinke's jaunt down south was clear. "Third plane is the charm?" he tweeted. "Hopefully enroute to meet with #Florida Governor Scott. #WheelsUpMaybe #PretzelsOrCookies." Zinke was making good on a promise to meet with Florida's Republican governor, Rick Scott, to discuss Interior's draft proposed five-year offshore drilling program. Unveiled last week, the plan would open nearly all federal waters for leasing. On a phone call Thursday with reporters, Zinke indicated that he would have a dialogue with Scott, a likely Republican candidate for U.S. Senate later this year, who he knew would oppose the plan (Energywire, Jan. 5). Almost as soon as Zinke touched down in the Sunshine State, Florida was exempted from the sweeping effort to open U.S. waters to oil and gas drilling. Drilling would still be banned off Florida's coast. "I have witnessed Governor Scott's leadership through hurricane season and am working closely with him on Everglades restoration. He is a straightforward leader that can be trusted," Zinke wrote in a statement attached to a 6:48 p.m. tweet. "President Trump has directed me to rebuild our offshore oil and gas program in a manner that supports our national energy policy and also takes into consideration the local and state voice," he added. "I support the governor's position that Florida is unique and its coasts are heavily reliant on tourism as an economic driver. As a result of discussion with Governor Scott's and his leadership, I am removing Florida from consideration for any new oil and gas platforms." The decision was far from sudden, Scott and Zinke told reporters yesterday in the Tallahassee, Fla., airport. Both said the agreement evolved during meetings over the last 12 months. 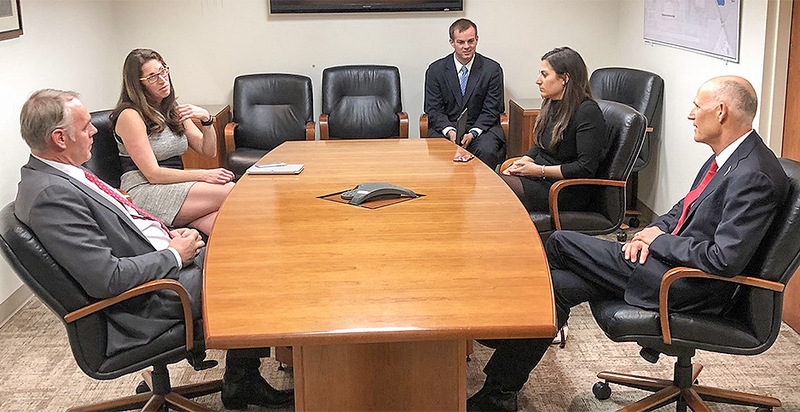 "Our tactic was to open everything up and then meet with the governors, meet with the stakeholders to make sure as we shape it, we shape it right," Zinke said. "The president makes it very clear that local voices count, states count." Zinke held firm that it was Scott who swayed the White House's decision and did not offer any other explanation when pressed by reporters. His answer was the same when asked why this decision meant there would be no drilling off Pensacola but there could be off of Gulf Shores, Ala., which is a mere 20 miles away. "Because the great state of Florida has expressed and the governor has expressed his desire not to drill," Zinke said. "We're going to look at that; that's part of our plan." Zinke said Florida's coast is different from others in that it is primarily used for recreation. Louisiana, for example, is a "working coast" instead. According to Zinke, part of Trump's directive was to identify the differences and make sure their offshore drilling plan reflected that. It's unclear whether other states could be exempted from the offshore plan. 'Local voice matters' — but which ones? Scott's positions on energy and the environment have shifted as he ponders pursuing a Senate seat. As governor, Scott has frequently sided with Florida's industries, including electricity and sugar companies, in battles over the environment. Environmentalists have argued that this has come at the expense of preserving the state's air and water. Scott had railed against federal environmental regulations and sued U.S. EPA over its Clean Power Plan rule for cutting power-sector greenhouse gas emissions. Reports surfaced years ago that his administration banned the use of the terms "climate change" and "global warming" in any official capacity. Florida is front and center on those issues, particularly as they play into sea-level rise, but it's one that has been left to the coastal communities to tackle with limited state help. What's more, the GOP-dominated Legislature has struggled with the state's energy needs. The state has few entry points for natural gas outside the Gulf of Mexico and the newly built Sabal Trail pipeline. Scott has deflected any questions about a Senate run, but it is widely expected that he will try to unseat longtime Sen. Bill Nelson (D) this fall. Nelson, who has been outspoken against offshore drilling, chalked up yesterday's announcement to politics. "I have spent my entire life fighting to keep oil rigs away from our coasts," Nelson said. "This is a political stunt orchestrated by the Trump administration to help Rick Scott who has wanted to drill off Florida's coast his entire career. We shouldn't be playing politics with the future of FL," Nelson said on Twitter. Zinke's announcement would have lined up well with the wishes of Florida's previous governor, Charlie Crist (D), who is now in Congress. Yesterday, Zinke signed off his string of tweets: "Local voice matters." But the sentiment among Zinke's detractors last night was that some local voices seem to "matter" more than others. "If Secretary Zinke has really turned over a new leaf and decided to listen to local voices, he should listen to the outpouring of opposition coming from communities, businesses, and elected officials from both parties up and down our coasts and promptly withdraw his radical offshore drilling plan," League of Conservation Voters Deputy Legislative Director Alex Taurel said in a statement. Environmental groups roundly slammed the Florida move as a political stunt. "Had Zinke cared about the wishes of coastal communities or how drilling off their coasts will affect them, he would have proposed a plan that shrinks drilling even further, not proposed expanding operations to nearly every corner of our waters," Sierra Club Florida Director Frank Jackalone said in a statement.